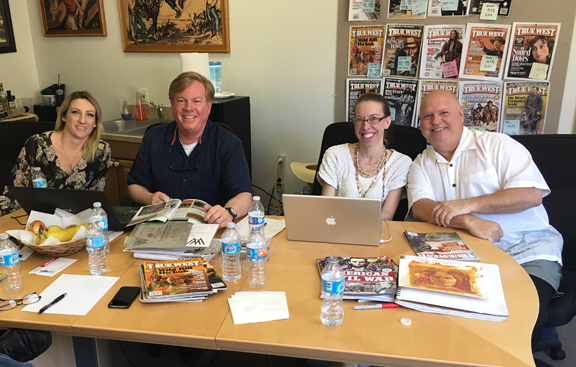 We had our annual sales planning session on Monday at the True West World Headquarters. Every single person in this picture is a hero to me. They keep the lights on. Ken Amorosano and Cynthia Burke. 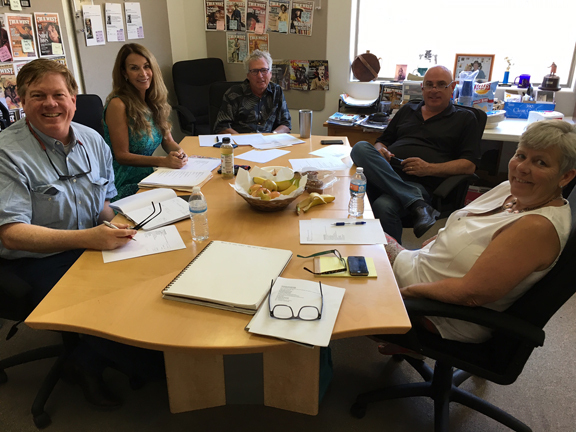 And yesterday we had our annual editorial planning meeting at the True West World Headquarters. These are the editorial and production managers who will make all 12 issues next year, happen with solid history, wit and style. and Robert Ray. Big plans for 2018. When I was much younger than I am now, I dreamed of having an oak table where the brightest and the most talented folks would show up every day and work on history projects that excited me. Thanks for the desk Betty Radina and Ken Amorosano. And thanks to everyone who sits around it and argues with me. What a gift. We've got some tremendous ideas and ambitious plans for 2018. "Life itself is a gift and all the people we've come to know have qualities worth considering and celebrating—in time." It's a pleasure to be a part of such an amazing, talented group of people dedicated to preserving our Western history and heritage. We are more than co-workers, we are family! !